The Nest API uses the OAuth 2.0 protocol for authentication and authorization. 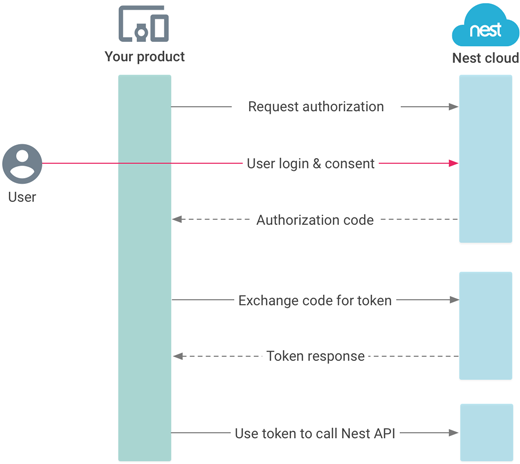 Before your product can access private data using the Nest API, it must obtain an access token that grants access to that API. A single access token can grant varying degrees of access to multiple sections of the API. The authorization sequence begins when your product redirects a browser to a Nest URL with query parameters indicating the requested access. 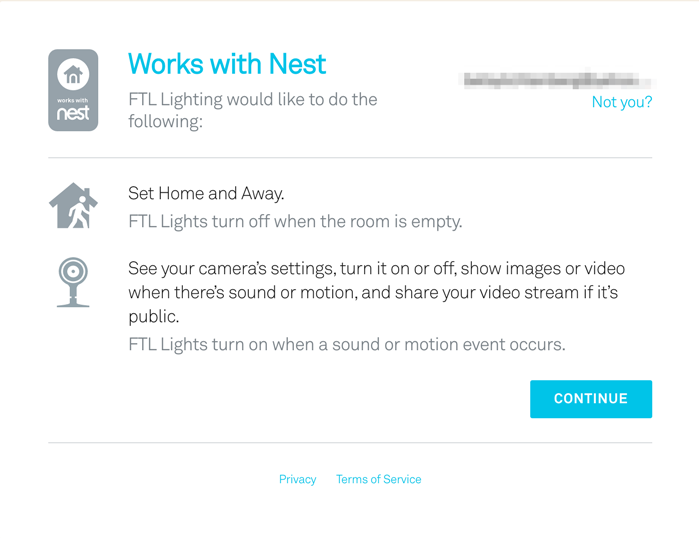 Nest handles the user authentication, session selection, and user consent. The result is an authorization code, which your product can exchange for an access token. Your product can then use the access token to make calls to the Nest API. If you have not already done so, create a client. If you have an existing client, check the Overview tab of the client page to find its OAuth 2.0 credentials. Redirect URI or PIN-based authorization? When you are configuring your client, you are prompted to enter a redirect URI or leave the redirect URI fields blank to use PIN-based authorization. If your product is a device that doesn't have an associated app or web page (for example, a fitness tracker, an appliance, or a security panel), leave the Redirect URI fields blank. If your product has a browser component, the best practice is to include a redirect URI. Learn how to configure redirect URIs. The client configuration includes a set of permissions (also called scopes). A permission is a variable parameter that controls the set of resources and operations that an access token permits. It is generally a best practice to request permissions incrementally, at the time access is required, rather than up front. When you save the configuration, your client is assigned a unique Client ID and Client Secret. In addition, your client is assigned an authorization URL. The authorization URL includes a state parameter that you can use to test for possible cross-site request forgery (CSRF) attacks. See Test for CSRF attacks. After your client is configured, you can request an authorization code (sometimes called a PIN code). The authorization code is not the final token that you use to make calls to Nest. It is used in the next step of the OAuth 2.0 flow to exchange for an actual access token. This step provides assurance directly from Nest to the user that permission is being granted to the correct product, with the agreed-upon access. We present a Works with Nest page that asks the user to grant access to your product. This identifies your product and outlines the particular user permissions (scopes) that your product has requested. The words on the screen come from your client configuration. Go ahead and click [ACCEPT] yourself to see what the user sees. By clicking the [ACCEPT] button, the user is approving your product's request to access their data. If you leave the Redirect URI fields blank in your client configuration, the user is redirected to a Nest page that displays a PIN (authorization code). Your device UI should then prompt the user to enter the PIN manually. If you include a redirect URI in your client configuration, the user is redirected to a page in your cloud (or localhost), and Nest automatically sends the authorization code to the user's device. Before accepting the authorization code, your product should ensure that the value returned in the state parameter matches the state value from your original authorization request. This ensures that you are dealing with the actual user and not a malicious script. If the state values do not match, you should throw a 401 Unauthorized HTTP error code in response. A CSRF attack is an attack that forces an end user to execute unwanted actions on a web application in which they're currently authenticated. To help prevent CSRF attacks, we recommend that you always submit a non­guessable state when requesting authorization. 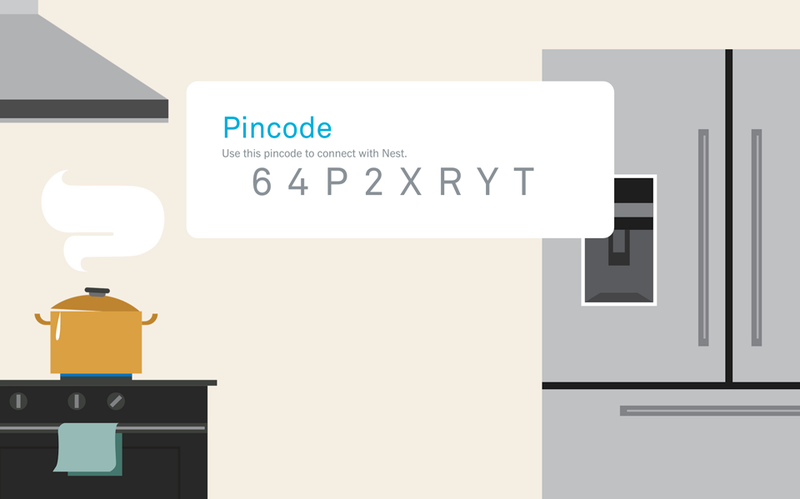 This way, your Works with Nest integration can verify that the access codes obtained from the Nest cloud are in response to requests made by your product, not some other product. The user consents to the request. Your product receives this state value and should be programmed to only accept redirects with a verifiable state. Note: If using multiple redirect URIs, do not use the same state parameter across all redirect URIs. Vary the state for increased security. There are multiple ways to generate a non-guessable state parameter. You can provide randomized state values from a dictionary kept in memory or a re­computable value. You can use a private key with some easily verifiable variables—for example, the client ID and a session cookie—to compute a hashed value. This results in a byte value that is difficult to guess without the private key. Another suggestion is to hash the current date and time. With this approach, your application must save the time of transmission to verify it or allow a sliding period of validity (for example, using the Time-based One-Time Password algorithm [TOTP]). After computing the keyed-hash message authentication code (HMAC), base-64 encode it and pass it to the Nest cloud as a state parameter. If the authorization code request fails, users see an error message. For more information on these messages and how to prevent them, see the Authorization Reference. The final step in obtaining an access token is for your product to ask for one using the authorization code it just acquired. This is done by making an "x-www-form-urlencoded" HTTP POST request. Include the below parameters in the request. All four parameters are required. Before each POST call, get a new authorization code. To do this, reload your authorization URL. Then change the POST's code parameter to include the new authorization code. See examples in various languages. Postman provides an easy way to test OAuth requests. On the Headers tab, make sure Content-Type = application/x-www-form-urlencoded. On the Body tab, include the following key:value pairs. access_token — The access token for the user. This value must be kept secure. expires_in — The number of seconds remaining, from the time it was requested, before the token expires. If the request fails, you receive an error in the form of an HTTP Status Code. For more information on these errors and how to prevent them, see the Authorization Reference. After a product obtains an access token, it sends the token to a Nest API in an HTTP authorization header. It is possible to send tokens as URI query-string parameters, but we don't recommend it, because URI parameters can end up in log files that are not completely secure. Access tokens are valid only for the set of operations and resources described in the scope of the token request. For example, if an access token is issued for the Nest Thermostat API, it does not grant access to the Nest Camera API. Postman provides an easy way to test API calls using Content-Type = application/json. It is important that you code your product to properly handle a 401 Unauthorized error by redirecting the user back to the start of the authorization workflow. If a user removes a Works with Nest connection, your product receives an auth_revoked event and the connection closes.